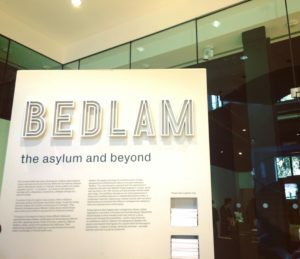 “Bedlam: the asylum and beyond” is the title of the new Wellcome Collection exhibition, which opened last month and will remain open Tuesday – Sunday until 15th January 2017. I was in London with a few hours to spare last week and I paid the show a visit; what I found there was compelling, intriguing, and left me with plenty of food for thought. The exhibition is compact, no more than four or five rooms, but packed full of an extensive if eclectic variety of artefacts and artwork that seek to offer insight into what asylums have been, and what their successors might be like in the future. The exhibits range from photographs to building plans, from paintings to newspaper articles, and even embroidered letters to Queen Victoria. Part of the display is dedicated to extraordinary works of art created by patients while they were receiving treatment in an asylum or psychiatric hospital or after their discharge, ensuring that the narrative is not dominated by historicised or medicalised perspectives. Together, the exhibits trace the progress of the Bethlem Royal Hospital in London (colloquially known as “Bedlam”), as it moved both geographically and ideologically, transforming from an 18th century ‘madhouse’ at Moorfields, to a 19th century ‘lunatic asylum’ at Southwark and finally to a 20th century ‘mental hospital’ at Beckenham. As the exhibition follows this chronological progression, it also regularly includes pictures and videos of the town of Geel in Flanders. In the 13th century, at the same time as Bethlem was originally founded in London, the town began attracting pilgrims seeking recourse from St Dymphna, the patron saint of the “mentally distracted”. People who were not cured during their trip often remained in the town, and many were taken in by local families, joining them in working on their farms. This practice has continued to the present day and by the early 20th century this family care system had become a popular alternative to the Belgian state asylums. The exhibition did not draw any direct comparisons between Geel and the Bethlem Royal Hospital, with regards to either the physical geography or the frameworks of care and treatment they have embodied, but their close proximity certainly invited consideration. Indeed, while many of the individual pieces invite you to consider what it feels like to receive treatment in an asylum, the exhibition as a whole left me thinking more about what an asylum, any asylum, means for mental health treatment more broadly. Repeatedly we saw treatments shift as buildings transformed, and it was often difficult to tell whether scientific advances prompted re-designed spaces or whether newly created buildings allowed and encouraged new treatment approaches. Moreover, I was left wondering whether there is a fundamental difference between the sort of treatment that can be delivered in an institution like Bethlem and the sort of care that is given in a home, like those in Geel. The exhibition concludes with an art installation entitled ‘Madlove’, which emerged from workshops run by artists Hannah Hull and The Vacuum Cleaner with 432 people with lived experience of mental distress. They collected and synthesised thousands of suggestions for a utopian mental health hospital, which were presented through Rosemary Cunningham’s illustrations and Benjamin Koslowski and James Christian’s model of a designer asylum; a place where it might be “truly safe to go mad”. As I left the exhibition it seemed increasingly clear that the context of treatment, the physical site of care, surely has a greater impact on the range of therapies and medications which are offered or recommended to people experiencing mental ill-health than we might feel comfortable admitting. That mental health treatments are designed to be provided within a system, that they are often created with a specific setting in mind, is rarely discussed in the literature I’ve read. Yet the exhibition makes it obvious that context, whether it is systems, geography, or architecture, frames and limits how we treat mental health. A building curtails our options, making some approaches seem obvious and others appear outlandish. I cannot help but think that the treatment one might provide in a setting such as Madlove would require a completely different evidence base to the one upon which we base our current treatment options. If you’re interested in finding out more about the intersection of the arts and mental health treatment, try this video from the editor of The Lancet Psychiatry. Further information about the Wellcome Collection exhibition, “Bedlam: the asylum and beyond”, including opening hours and exhibition text, can be found on the Wellcome Collection website.